Although early farmers planted orchards on their homesteads as early as the 1860s and 70s, the fruit industry in San Juan County did not really take off until the 1890s. This was due to the growing market for fruit on the West Coast and nationwide. 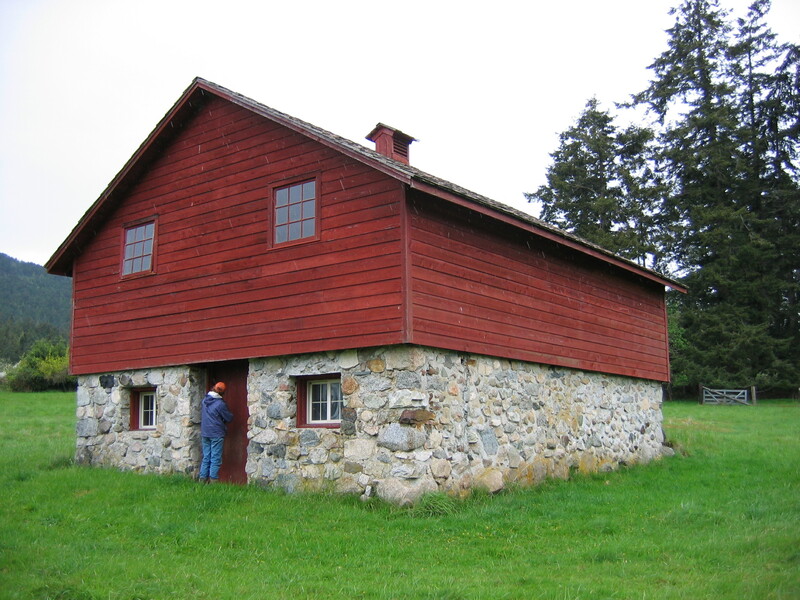 Production began in mid-1800s in Oregon with stock developed and supplied by Dr. John McLoughlin at the Hudson Bay Farm at Fort Vancouver, established in 1824. Orchards had become well established in western Oregon by the 1860s, but large-scale production west of the Cascades did not really begin until the 1880s. In San Juan County, the Italian prune-plums, which had become very popular through the efforts of the Portland horticulturalist J. R. Cardwell, were first planted on Orcas in the mid-1870s. These were followed by apples and pears, as well as apricots, cherries, peaches, and plums. Berry fruits such as blackberries, raspberries, and strawberries were also grown in the islands. The market for island fruit was always difficult, although when the major means of transportation in the region was shipping, there was more competition with the mainland than later, when the railroads arrived. The county’s chief market was Seattle, although fruit producers also shipped to Bellingham, Port Townsend, Tacoma, and Victoria. James Tulloch on Orcas estimated that he shipped a total of 75,000 boxes of apples, or 3-4,000 boxes annually at the height over his thirty-five year career. Overall annual shipments from Eastsound are estimated at 25-30,000 boxes per year each of apples and pears, with additional thousands going out from Olga, Orcas Village, and West Sound. The prune industry was one of the first to succumb to the vicissitudes of regional and national economic forces. Because of the heavy planting in Western Oregon and Washington in the 1880s, increased production coincided with national depression of the mid-1890s (precipitated by the Panic of 1893). Fruit growers then moved into apple and pear production. 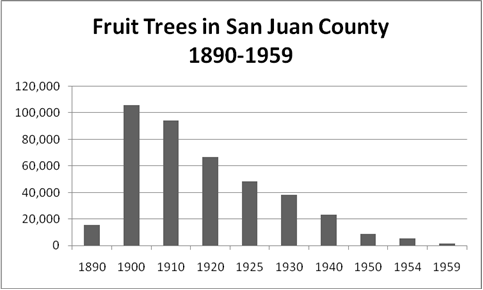 Apples peaked in San Juan County around 1910 (the census for that year noted 76,731 trees); western Washington in that year still produced about a third of the total state crop. Not known at the time, this apogee was marked by an event that highlighted the prosperous future of the region: the Alaska-Yukon-Pacific Exposition of 1909. Held in the fall of that year on the future University of Washington campus in Seattle, the AYP was a “World’s Fair” that drew thousands to view the economic prosperity of the region. San Juan County had its “day” on July 14, and most of the exhibit was devoted to the local fruit industry. San Juan County brought home a banner, which still hangs in the Courthouse, for best cherries at the Expo. But the irrigated, better soils east of the Cascades produced fruit with more color (although inferior in taste, according to San Juan chauvinists), and by the 1930s the county was only producing a third of what they had achieved twenty years earlier, while western Washington as a whole only contributed two percent of the total state crop. According to census figures, county pear production peaked at 10,070 trees in 1925, and then steadily declined for the next two decades. By 1950, there were slightly more than 5000 apple trees—less than today—and fewer than 2000 pear trees. 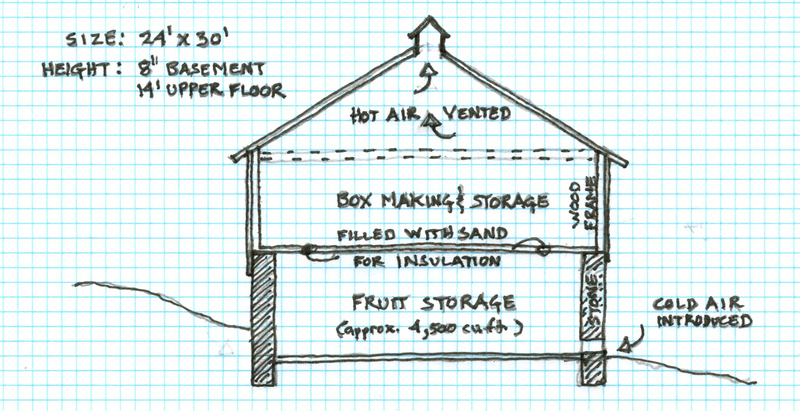 Farmers built barns in San Juan County specifically designed for the storage of fruit prior to shipment. Several of these buildings are of frame construction, consisting of thick (2×6) walls insulated with sawdust, with 12” square openings in the ceiling leading to ventilator shafts through the roof. This allowed warmer air to rise while retaining cooler air in the storage area. Some have a lower story of stone construction, with vents near the floor level that allowed cool area to enter, allowing the warm air to vent above.